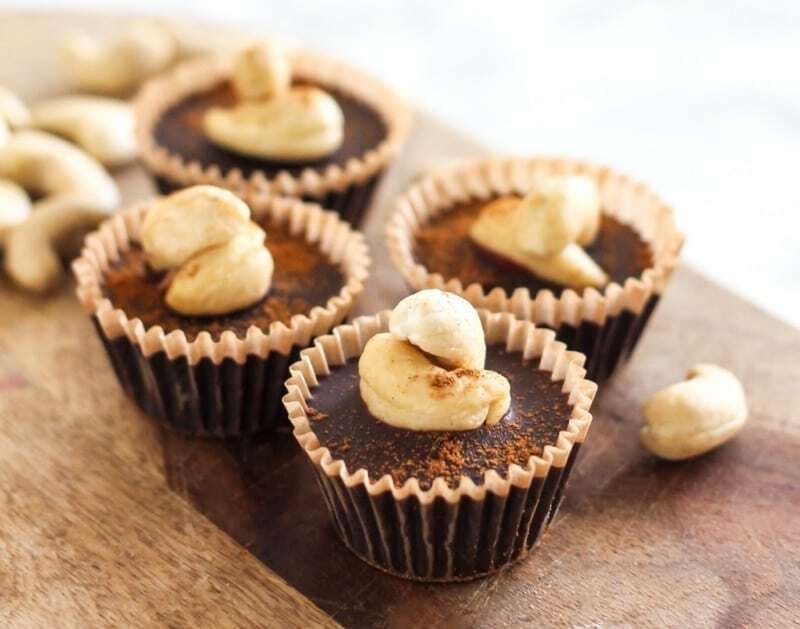 These Adaptogen-Infused Cinnamon Vanilla Swirl Nut Butter Cups taste divinely decadent and are sure to satisfy your chocolate cravings. With ashwagandha and maca, the’ll help your body adapt to stress while also delivering a hefty dose of antioxidants. Let’s talk adaptogens. 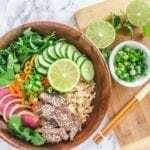 It’s a big buzzword you’ve probably heard a lot in your health and wellness circles, and was one of the 2018 food trends on the radar of MindBodyGreen, MyDomaine and Whole Foods. From functional mushrooms to roots and other forms of herbs, I’d be lying if I said I’m not 100% into trying and loving it all. I think we can all agree that there are plenty of food-related trends that come and go, but something’s telling me this one’s here to stay. 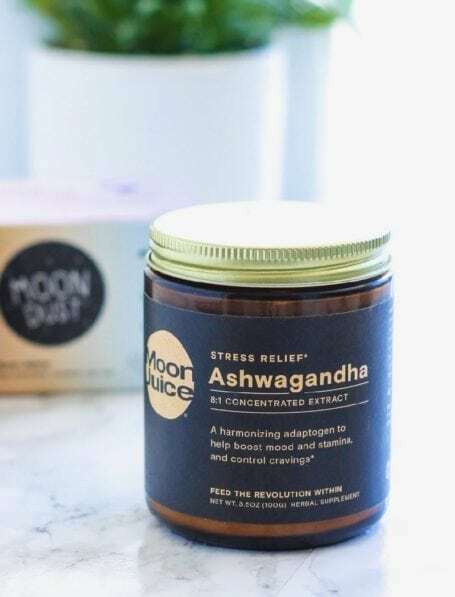 You might remember reading about these 6 adaptogens that help combat stress (+ and Adaptogen Latte!) 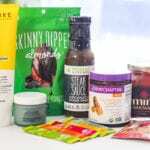 a while back, as well my favourite functional mushroom elixirs and a whole bunch of adaptogen-infused foods from the CHFA West Trade Show I attended earlier this year. If it’s a new term for you, no worries. Let’s do a quick memory refresher. These are foods – often herbs – that support the nervous system, help us adapt to stress, and bring our bodies back to homeostasis. They’re non-specific, meaning that it’s possible for anyone to use them and experience a benefit. As the name suggests, they adapt. That means if you’re super stressed, they can help you chill out. 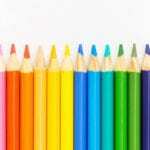 On the other end of the spectrum, if you’re feeling slow, sluggish, low on energy and brain foggy, they can help elevate energy and mental clarity. Not gonna lie – not always wonderful. I’ll admit that drinking mushroom elixirs is a bit of an acquired taste (it doesn’t take long to love ’em though! ), and a lot of adaptogenic herbs in powdered or tinctured form can taste horrid. However, that doesn’t mean you should give up. 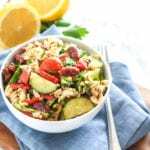 The fabulous news is that you can easily incorporate small amounts (that’s really all it takes for them to be effective) into your favourite recipes. That means reaping all the benefits without even knowing they’re hiding in there. 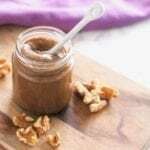 Smoothies are an obvious choice, but another one of my favourites is homemade nut butters. Just like making regular nut butter, it’s super simple. All you need is a food processor, some nuts, a powdered adaptogen of your choice, and a few optional flavourings, just for fun. 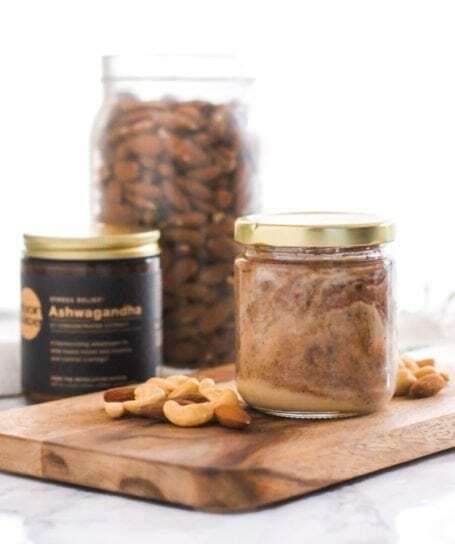 For the Adaptogen-Infused Cinnamon Vanilla Swirl Nut Butter I’ve got for you today, I chose ashwagandha and maca. Common in Ayurvedic medicine, this beauty has been used for over 2,500 years as an adaptogenic herb. Clearly, it’s doing something right! Ashwagandha has become known for its ability to support the adrenals and thyroid, lower cortisol, relieve anxiety and stress, and increase stamina. 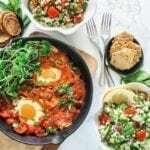 In addition, it had antioxidant properties that help support our endocrine and cardiovascular systems. 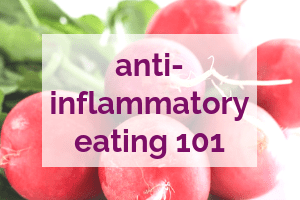 If you currently take any supplements for adrenal support, there’s a good chance you might find ashwagandha on the ingredients list. A little goes a long way – we’re talking teaspoons here, not cups! 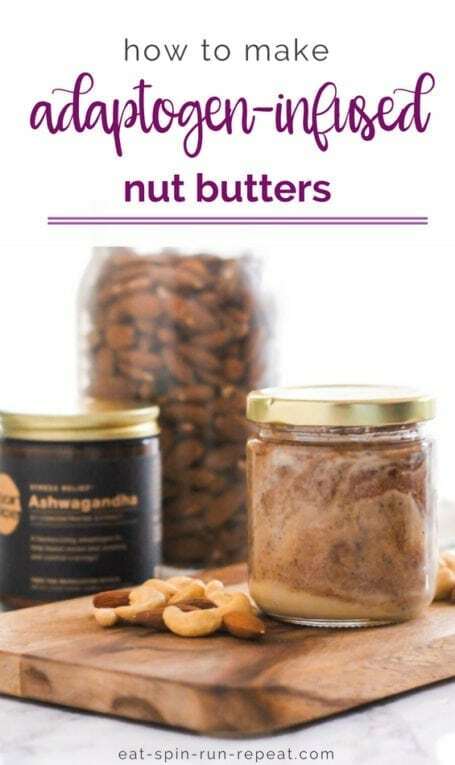 You can find ashwagandha sold as a tincture, powder, tea or tea, and I find powders work best for nut butters because they blend in easily and don’t throw off the consistency. I got mine from Moon Juice last time I was in LA (also available on Amazon for those of you in the US here). Maca has many of the same benefits as ashwagandha, and I actually quite enjoy the taste because it makes nut butters taste even more nutty. 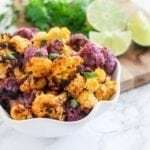 It’s a root that looks a bit like a turnip, and belongs to the cruciferous family, just like the kale and broccoli you’re probably a bit more familiar with. 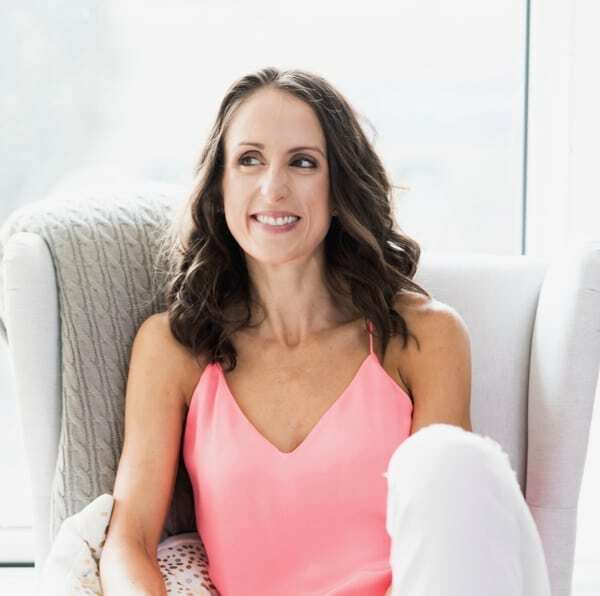 Maca is a natural aphrodisiac and a natural way to boost energy – minus that crazy crash that happens when you have a few too many cups of coffee. It’s high in antioxidants, which makes maca great for protecting our cells and guarding against diseases where oxidation causes bigger problems over time. Maca has also been studied for its fertility benefits and hormone-balancing effects. 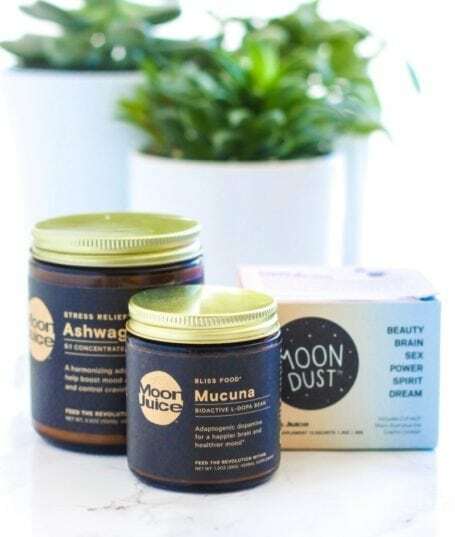 I get my maca root powder from Vega and Navitas Organics, and know that if you don’t want to have it in powdered form, Vega also sells it in capsules. Right, recipe time! 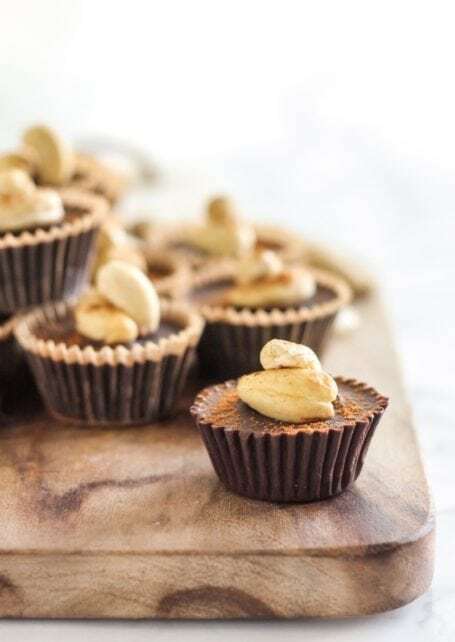 It’s your lucky day because not only do you get the nut butter recipe, but also a sweet application of it: Adaptogen-Infused Cinnamon Vanilla Swirl Nut Butter Cups! These put Reese’s cups to shame, and are one of my favourite ways to unwind at the end of the day. They also happen to be a very low-sugar treat as long as you use a high-quality dark chocolate. 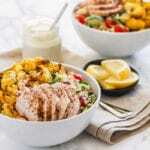 That’s great news for those of you who did the Feel Better Sugar Detox last month and want to carry on with your healthy habits! Whirl the cashews + 1 tbsp coconut oil for a few minutes in the food processor until it forms a butter. Add 1/2 the vanilla bean seeds, 1/2 tsp cinnamon and a pinch of sea salt. Process again, then pour it into a small jar. Once smooth and buttery, pour the almond butter mixture into the same jar. Use the end of a spoon to swirl the two together. Seal with a lid and store in the fridge for up to 2 months. Melt half of the chocolate on the stove using the double boiler method. Once the chocolate has melted, pour a little bit into each cavity, just enough to cover the bottom of each one. Set the pan in the freezer for 15 mins or until the chocolate has set. Remove the pan from the freezer and add about 1 tsp nut butter in the middle of each cup. 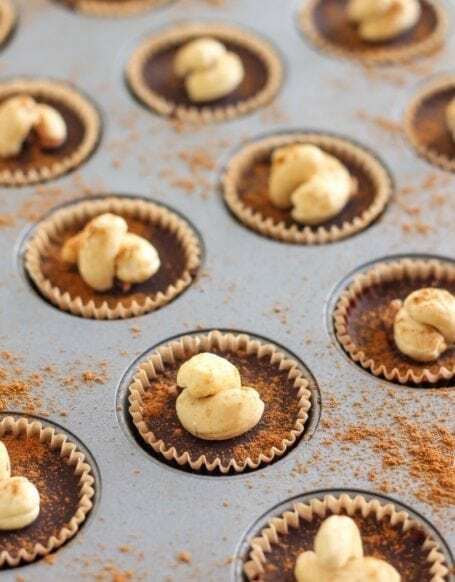 Press down a little bit on each one to ensure the top of each nut butter cup turns out flat. Melt the remaining chocolate in the double boiler. 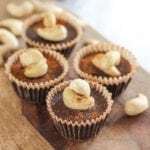 Distribute evenly across all mini cups to cover the nut butter. 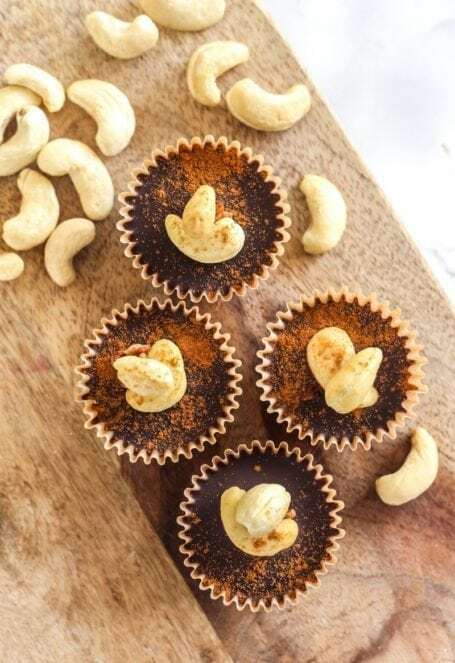 Freeze for about 10 minutes, or until the chocolate is semi-set enough to gently press the cashews in the top. Dust with cinnamon, then return to the freezer. Freeze for another hour or longer to ensure chocolate is fully set. Store leftovers in the freezer in an air-tight container. I don’t normally sweeten my nut butters. However, if you really really want to, a few pinches of stevia should be plenty. 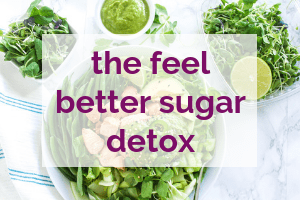 Using stevia or monkfruit will keep this recipe Feel Better Sugar Detox-friendly since neither contain fructose. About high-quality dark chocolate: Most are sweetened with cane sugar, and the amount per serving here is really, really small. So tell me… are you incorporating any adaptogens into your daily routine right now?